I attended a cheese making course last weekend and among other things (which will no doubt make appearances here!) we learned how to make mascarpone. So of course I thought this was the perfect opportunity to try it out (I had tried once before and it was not a very successful effort!). With all the tricks and tips gleened from Katherine, I felt confident I would manage to get it right this time. And get it right I did! I ended up with about 400g of gorgeous fresh mascarpone, although this type is more ricotta in texture than the commercial mascarpone you buy but still has that distinctive tang and flavour. It really was a breeze to make, I will absolutely be making it again and again. Katherine Mowbray runs cheesemaking courses once a month in Auckland, and I honestly can not recommend it more highly. It is absolutely worth the $100 fee, all the tips and tricks she passed on were invaluable. It is so great to see exactly how the process works and what each stage should look like. 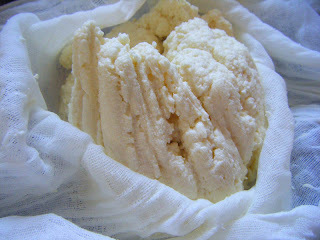 My next attempt will be feta and halloumi, which I am dying to try to make now that I have seen how it is done! 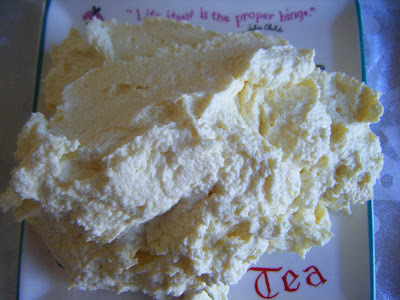 Heres how to make the mascarpone if you want to try it yourself! Pour this into a large saucepan that you have set up in a water bath (so you have one pan inside another and the pan with the milk in it isn't straight on the heat). Heat the two together until it reaches 90 degrees C. Add the juice of 1 - 2 lemons and stir through to get the milk mix to curdle. This was the tricky bit, as it really depends how acidic your lemons are as to how much you add. I used limes today and they obviously weren't acidic enough, so boosted it with about 1/4 tsp citric acid. What you are looking for is a substantial curdle, so that it sticks to the whisk, but you don't want to over do it so that the particles get too big as this makes the mascarpone less delicate. Take the pot off the heat and allow to cool. The curdled parts will settle together in this time and make it easier to lift out and drain. Line a colander with cheese cloth (or muslin- I believe they are the same thing!) 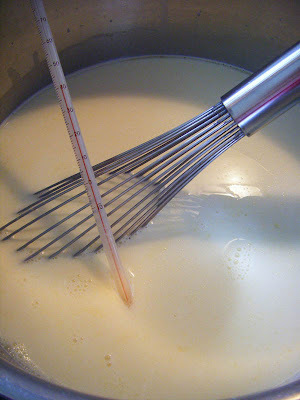 and when cool gently lift the curds out with a slotted spoon or small sieve. Draw the cloth up and knot it on a wooden spoon, placing it over the empty pot to drain all the liquid out. When it has stopped dripping it is ready to use. If you find the curd is not delicate enough you can loosen it up with more cream, I needed to do this, as I hurried mine a bit. I just blended it all together in the food processor and it was fine. Loosened with the cream I ended up with about 500g when I was done, so that was pretty good I thought. As this is a fresh cheese it needs to be used within a few days - I made it with the intention of making tiramisu straight away so that wasn't a problem! One thing I would stress that makes a huge difference. Get a thermometer to know exactly what temperature your milk is. 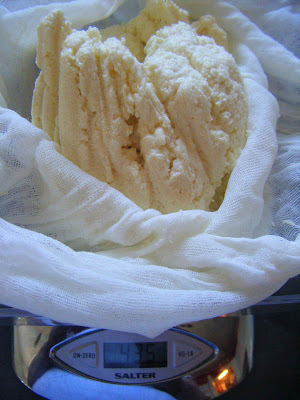 All my past efforts at cheese making have been without one and it makes a huge difference to KNOW you are at the right stage rather than guessing. Although I am amazed how much success I did have without knowing the exact temperature of my milk, I can see that the consistency of results is far more likely when using a thermometer, and when you are using that much milk and cream in one hit, you want it to work out! Hi Linda, may i know the cream that you used? is it a whipp cream? I would like to make mascarpoe too.. Yes it is whipping cream I used.